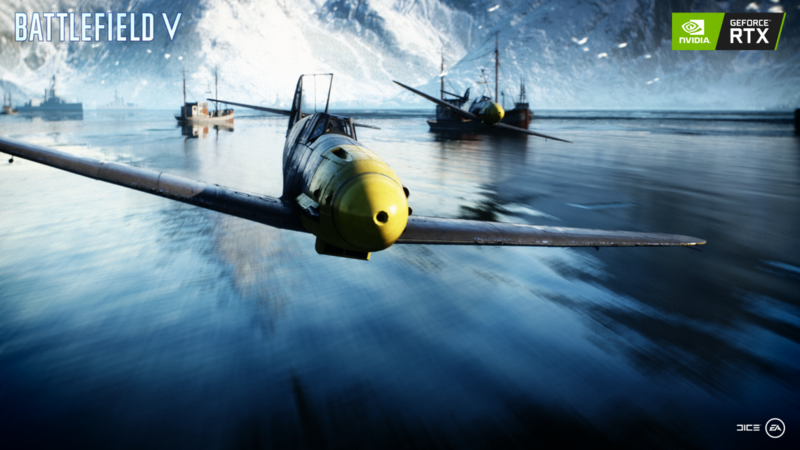 Battlefield V developer EA DICE revealed to Tom's Hardware that it had toned down some of the ray tracing effects in the game to enable more performance. DICE said that it is looking to hit a comfortable 60 fps on 1080p with ray tracing enabled. The game seems to be optimized for multi-core CPUs but does not support multi-GPU configurations. NVIDIA unveiled the GeForce RTX GPUs late last month and one of the games that was shown off during the demo was Battlefield V. The next installment in EA DICE's Battlefield franchise was shown to be highly photorealistic with real time reflections and shadows thanks to the ray tracing capabilities of the new NVIDIA GPUs. However, there have been concerns about ray tracing having a negative impact on frame rates as was seen in an early build of Shadow of the Tomb Raider wherein the game hardly managed 50 fps in 1080p with ray tracing enabled on the GeForce RTX 2080 Ti. As Battlefield V reaches the open beta milestone tomorrow, Tom's Hardware sat down with DICE's technical director Christian Holmquist to discuss about the game and the technicalities involved. The key takeaway is that ray tracing is indeed taxing on the GPU and DICE will be toning down the RTX effects in the game in order to improve frame rates and give a more credible look. Currently, DICE is working to enable a smooth 60 fps at 1080p with RTX enabled. Holmquist admitted that they haven't reworked the assets to be ray tracing compatible. The assets were chosen for ray tracing as and when they were deemed fit. Battlefield V will also scale well with the new multi-core CPUs as the DirectX Ray tracing (DXR) implementation in the new Frostbite engine can offload work to as many cores as possible — the game requires an AMD FX-8350 or an Intel Core i5-6600K as a minimum CPU spec. There are no indications of significant DirectX 12 performance improvements apart from a few optimizations and Holmquist said that the performance in DirectX 12 will be similar to that of Battlefield 1 on NVIDIA cards i.e. expect stuttery frames this time as well. However, DICE assures that the DXR implementation did not bottleneck the overall throughput. Since the game has been developed with NVIDIA's hardware in mind for ray tracing, if AMD launches an RTX-capable GPU sometime later, DICE will have to 're-tune' the game to support ray tracing on that card. Interestingly, there is no multi-GPU support inbound. This is a bit surprising as the NVLink interface that the new GeForce RTX cards sport allows for combined higher throughput. The Battlefield V open beta will not feature real time ray tracing support as the GeForce RTX cards themselves won't ship until September 20th. However, the final version of the game will have a day-zero patch that will add support for ray tracing.